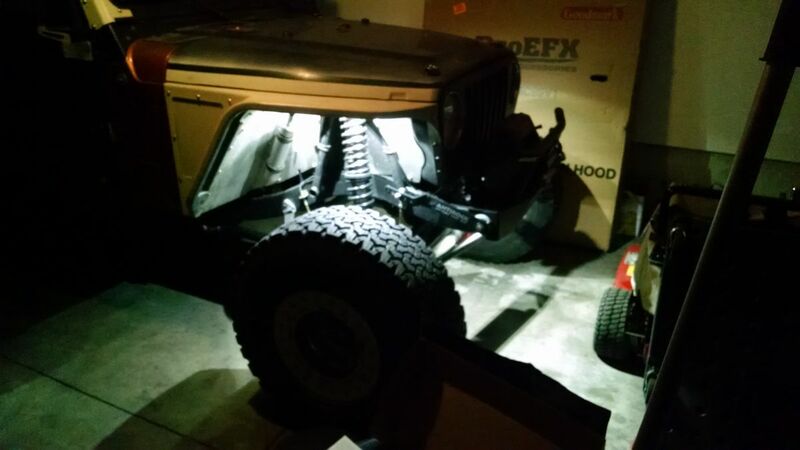 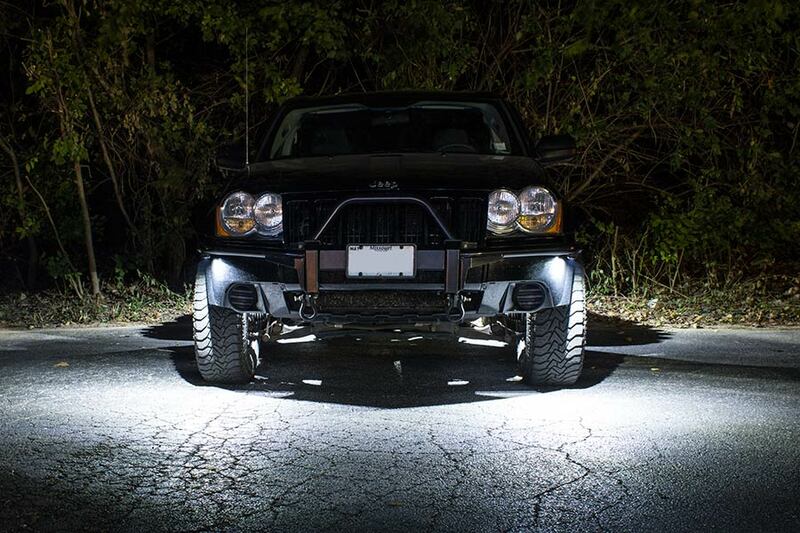 Waterproof Off Road LED Rock Light Kit - 8 LED Rock Lights: Shown Installed On Jeep In White. 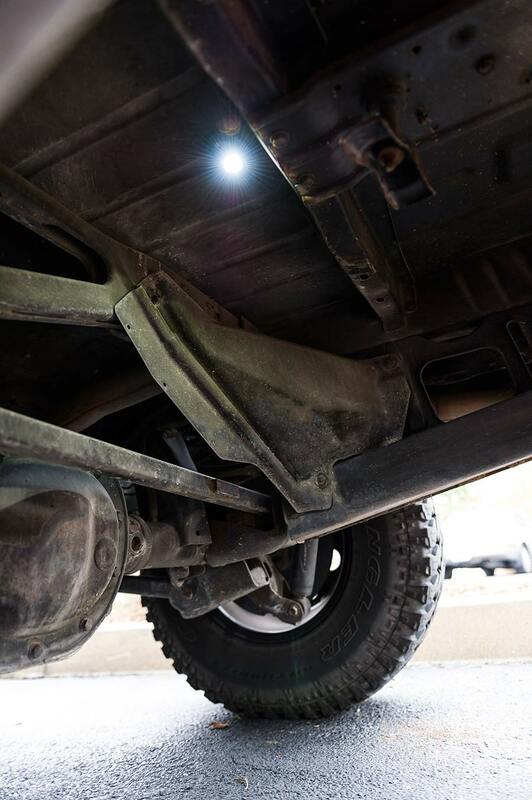 Waterproof Off Road LED Rock Light Kit: Detail View Of Harness Block Off Caps. 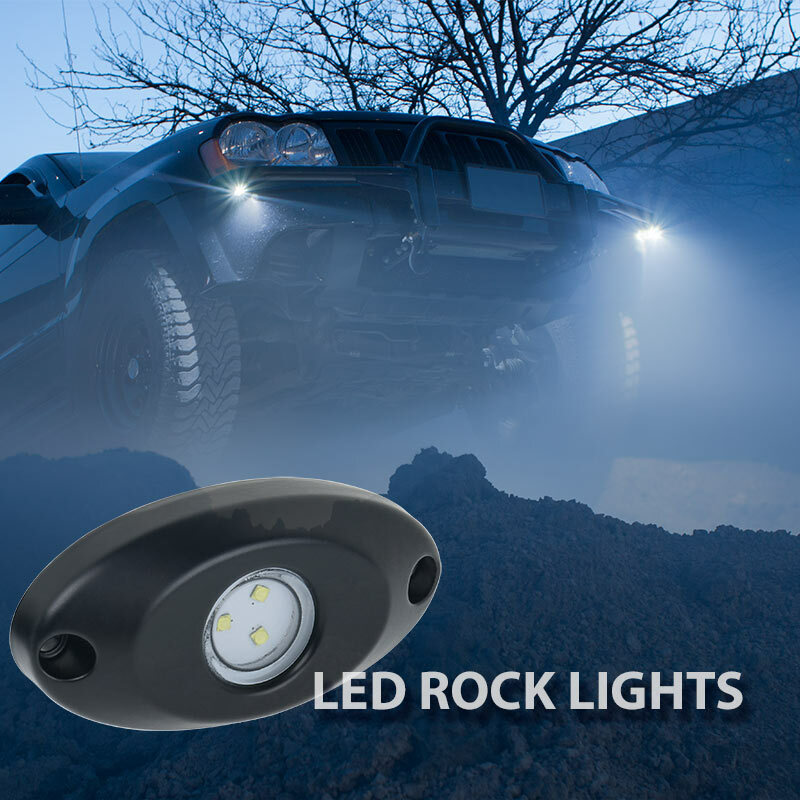 Waterproof Off Road LED Rock Light Kit: Showing Included Hardware. 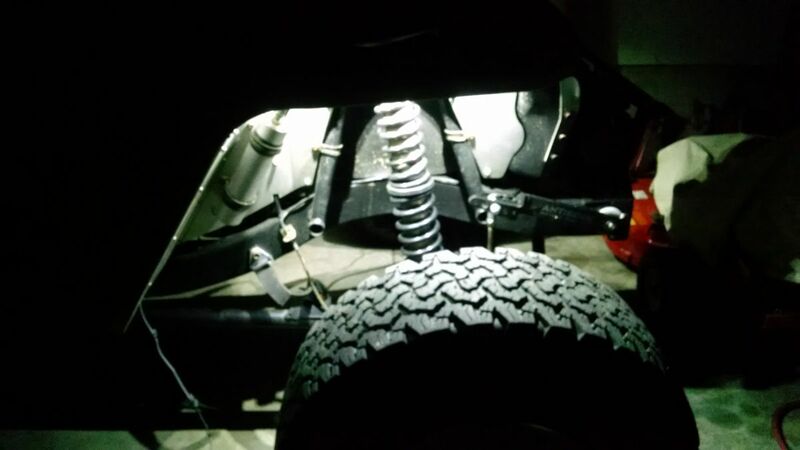 Waterproof Off Road LED Rock Light Kit: Showing Wiring Harness Connection To Rock Light. 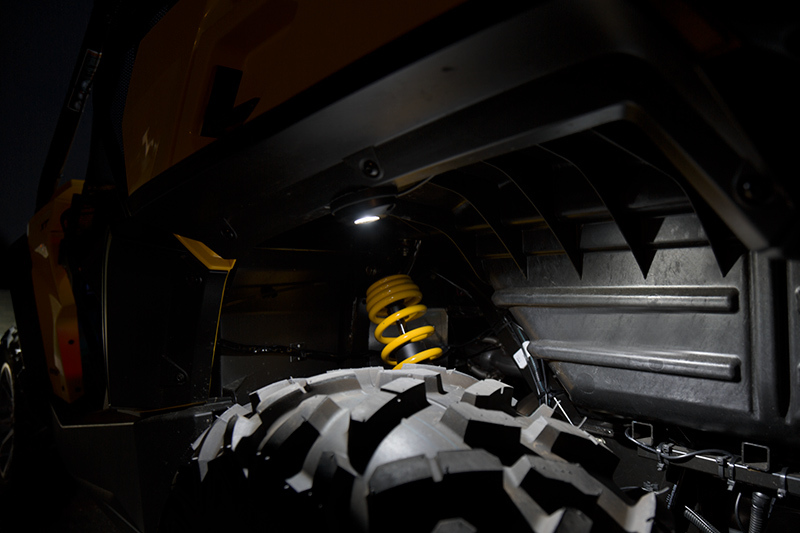 Waterproof Off Road LED Rock Light Kit: Shown Installed On Flat Rubber Mount. 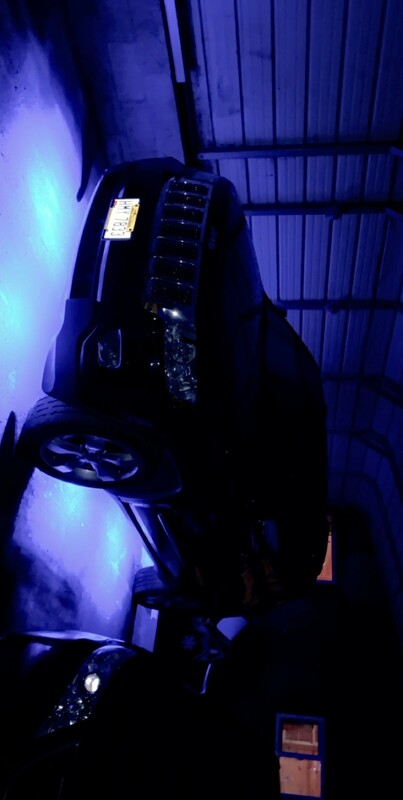 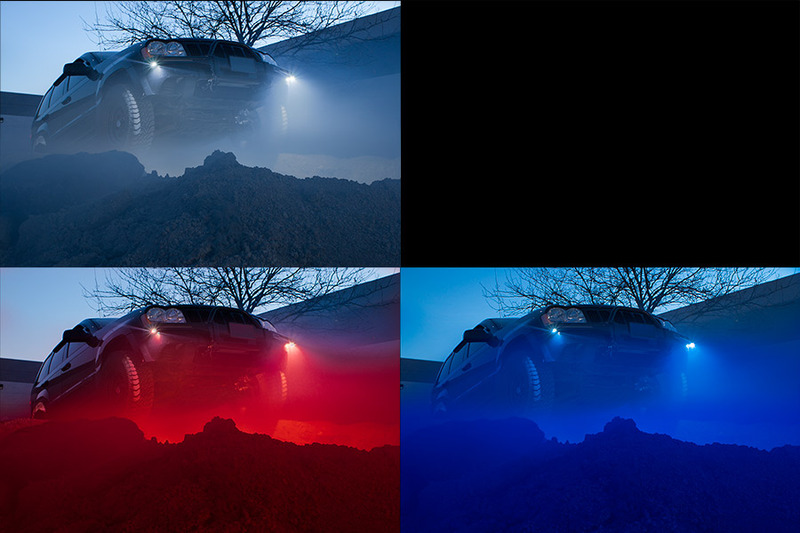 Waterproof Off Road LED Rock Light Kit - 8 LED Rock Lights: Shown Installed On Jeep In Red (Top Left), White (Bottom Left), Blue (Bottom Right). 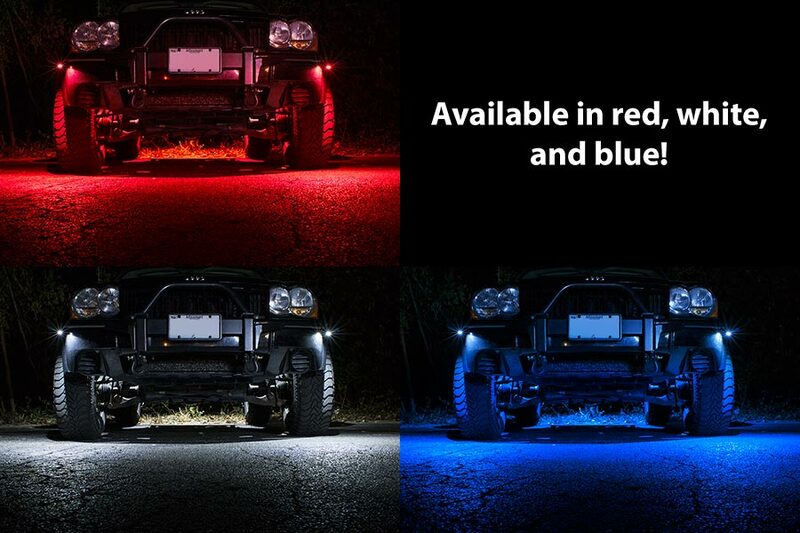 Waterproof Off Road LED Rock Light Kit - 8 LED Rock Lights: Shown Installed On Jeep In Red, White, And Blue. 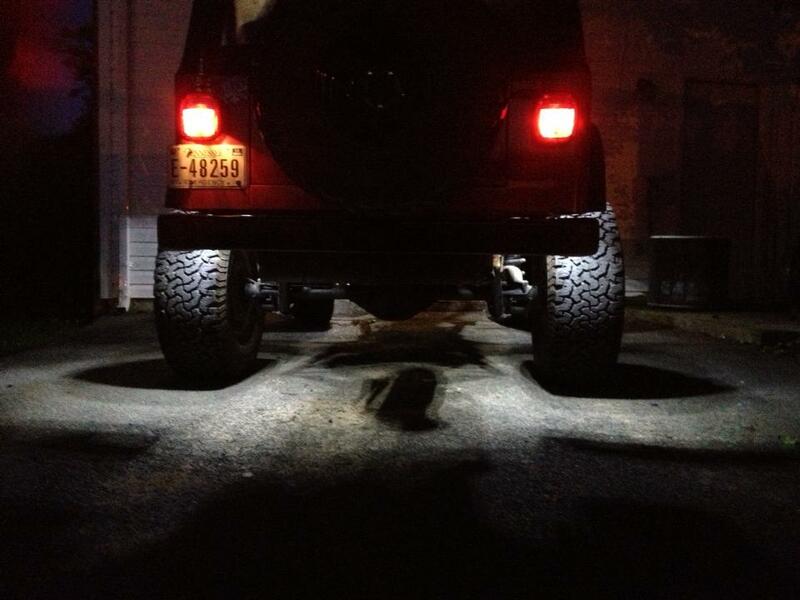 Waterproof Off Road LED Rock Light Kit - 8 LED Rock Lights: Shown Installed On Jeep And On In White. 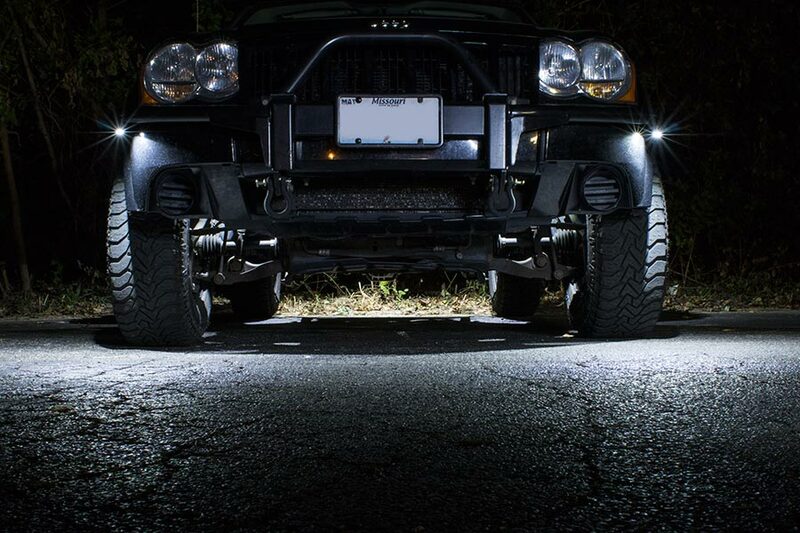 Waterproof Off Road LED Rock Light Kit - 8 LED Rock Lights: Front View Of Lights Installed On Jeep In White. 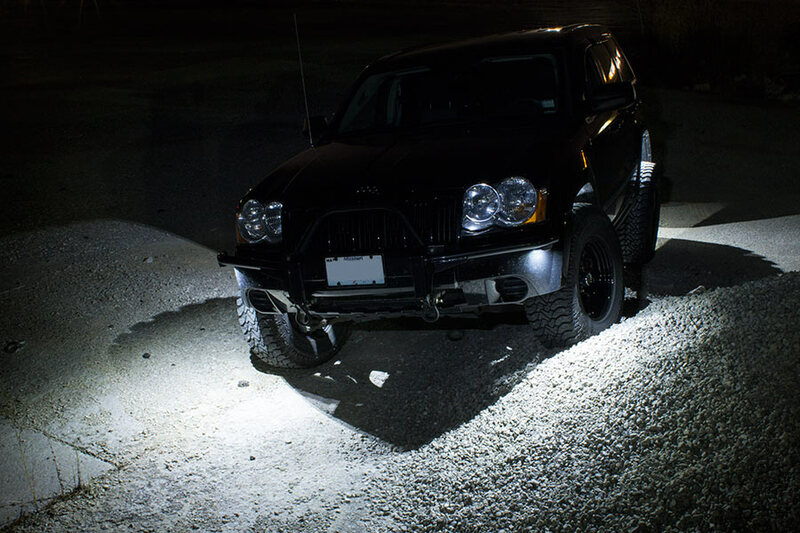 Waterproof Off Road LED Rock Light Kit: Shown Installed Using Curved Rubber Mounting Gasket. 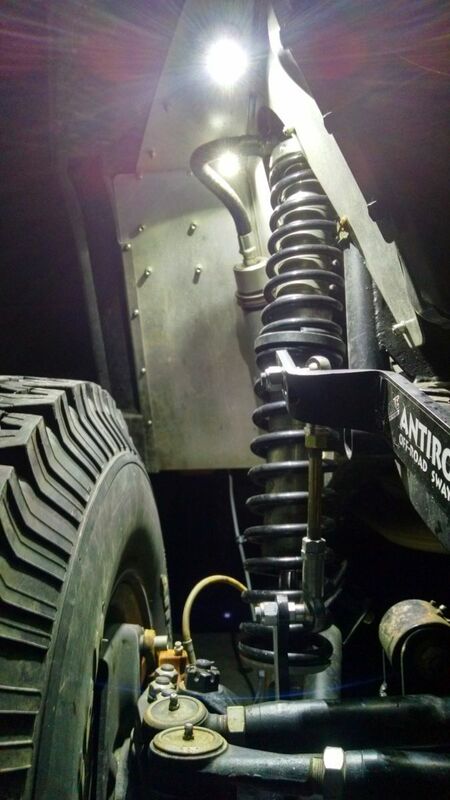 Waterproof Off Road LED Rock Light Kit: Shown Mounted Over Jeep Axle. 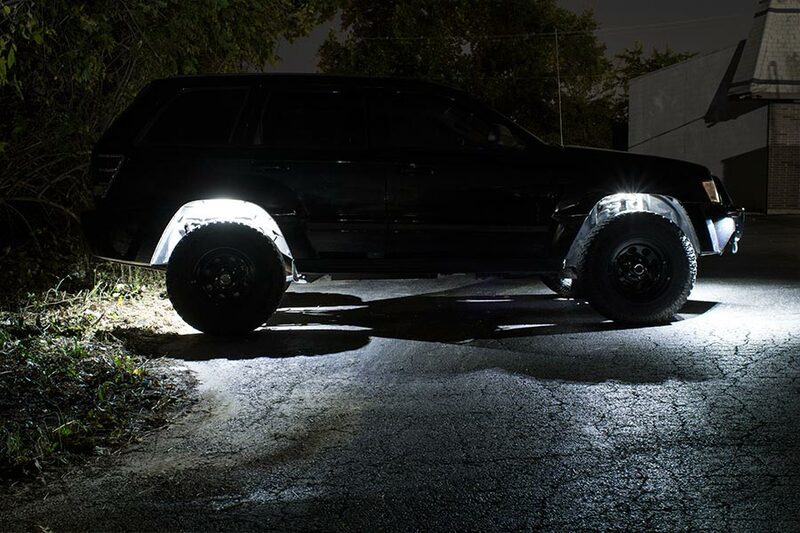 Waterproof Off Road LED Rock Light Kit - 8 LED Rock Lights: Shown Installed Over Front Wheel In White. 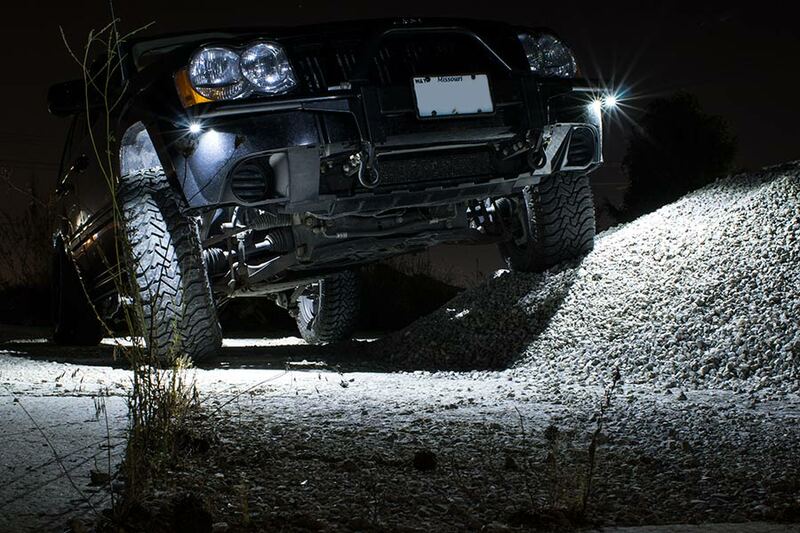 Rough terrain, dirt and even water are no match for LED rock lights. 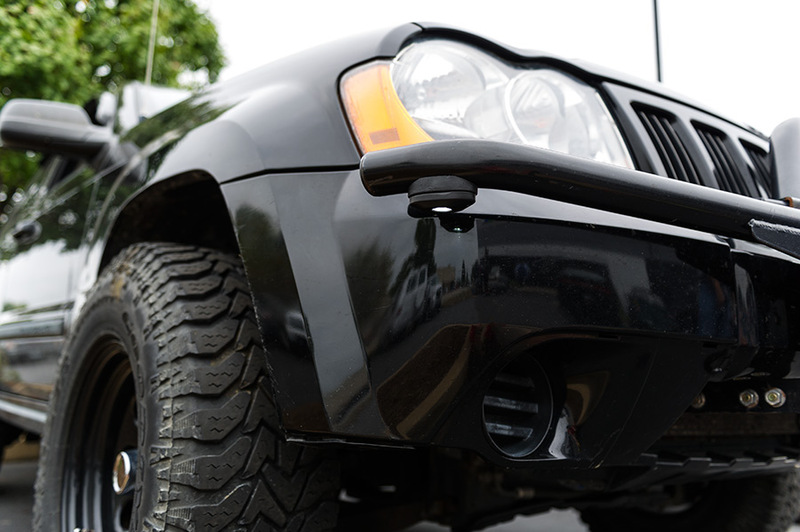 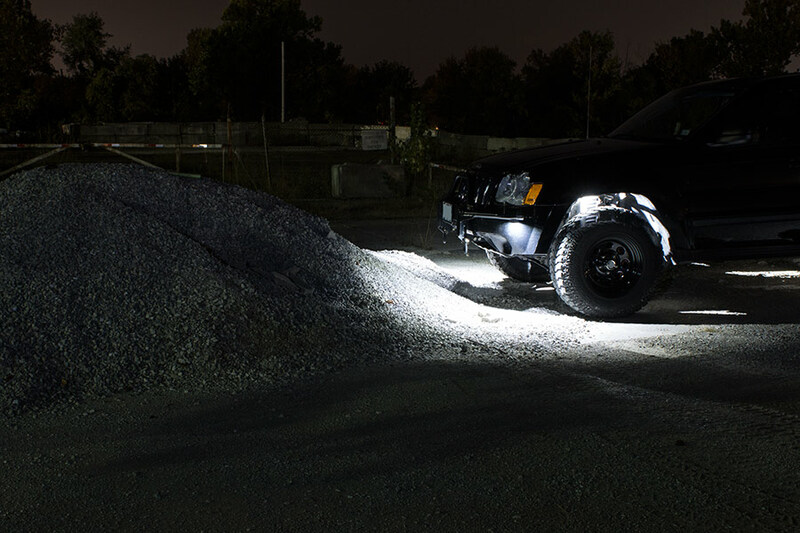 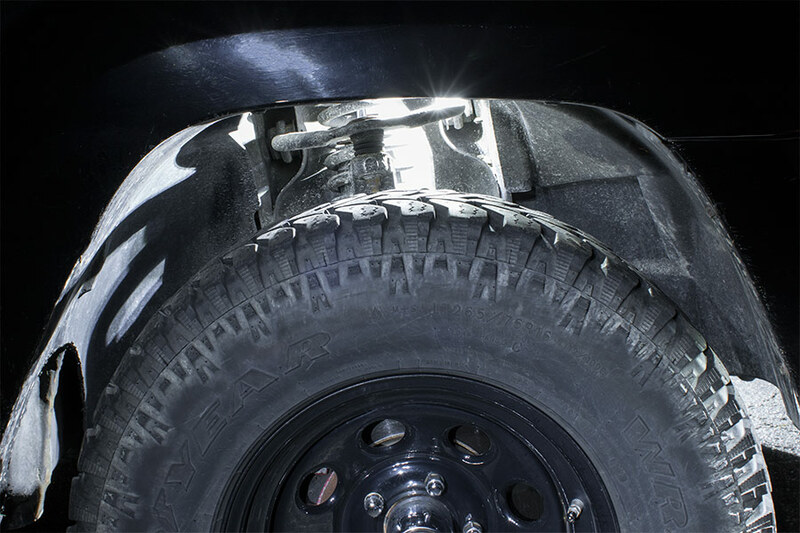 The tough little LED undercarriage lights are great for offroading at night in your truck or Jeep. 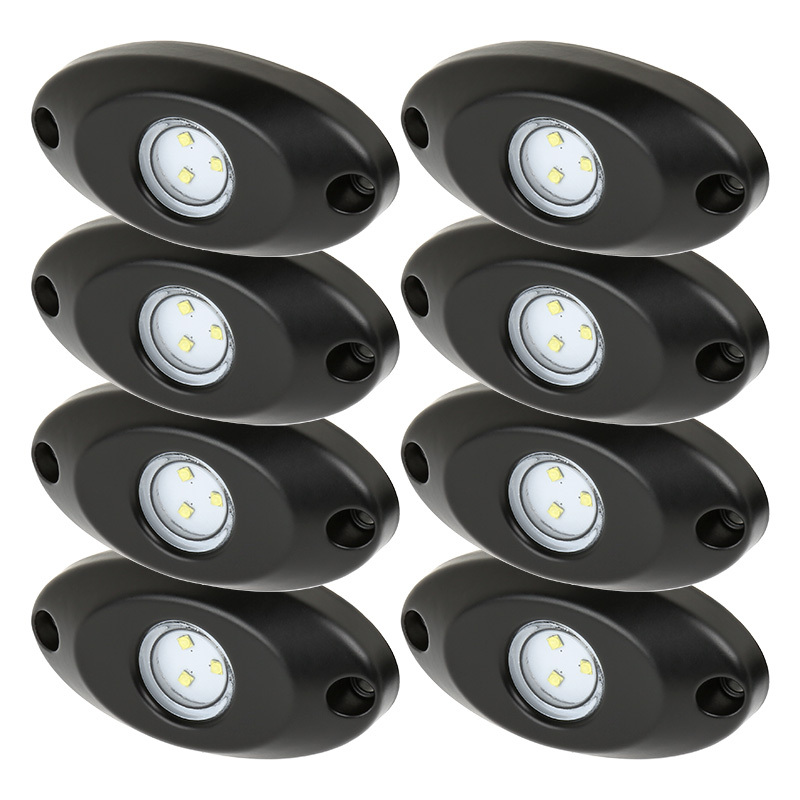 They'll add a fun touch of illumination to any tailgate party and function well as truck bed lights, interior or exterior boat lights, and dock lights. 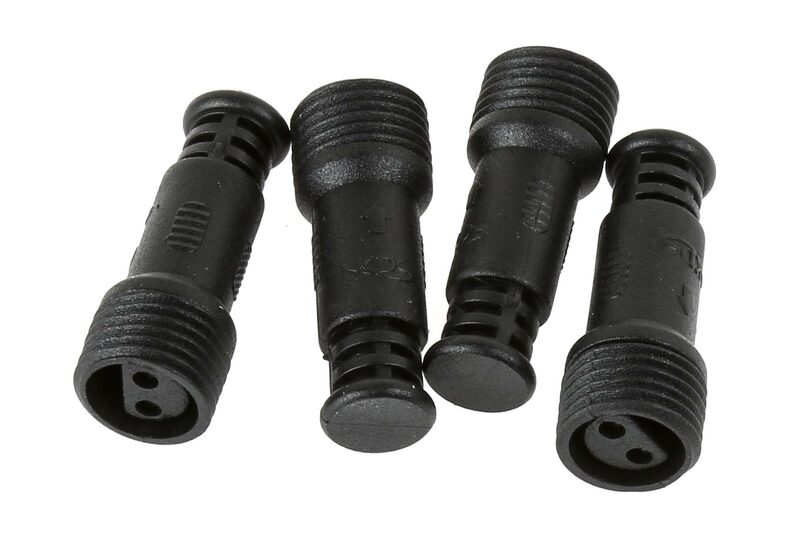 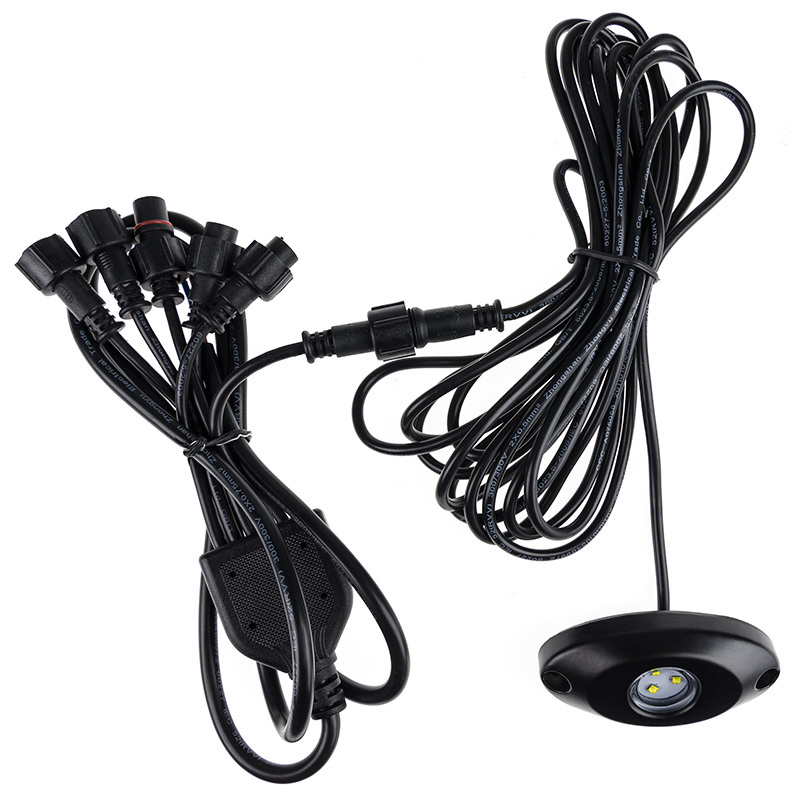 Included in the kit are 8 LED rock lights with plug-and-play connectors and 2 connector hubs. 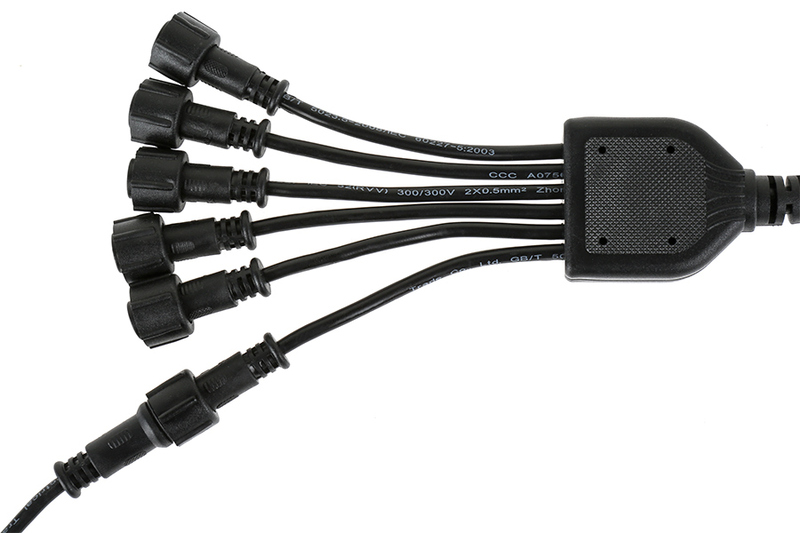 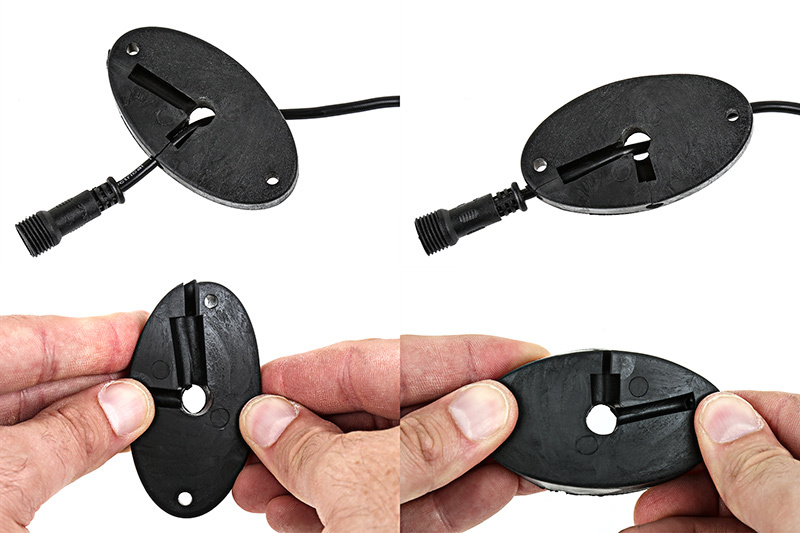 Each hub has 6 connectors, which allows you to add up to 4 additional single rock light modules. 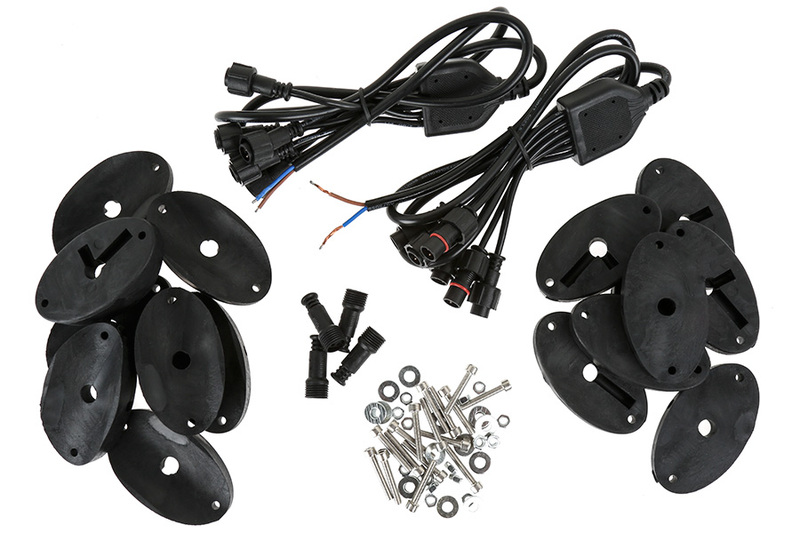 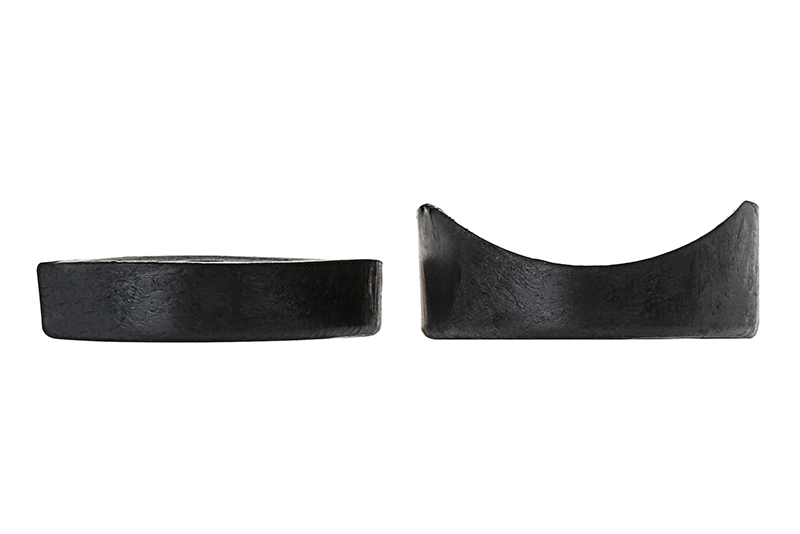 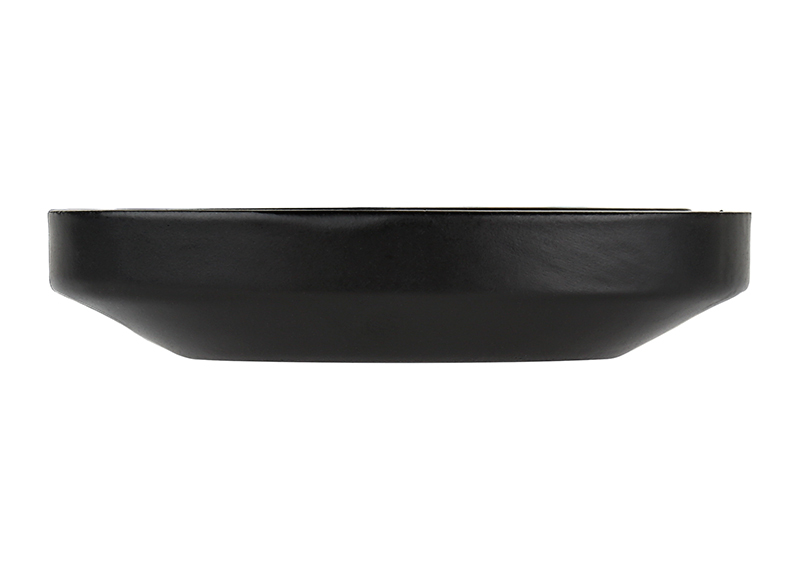 Also included in the kit are 16 rubber gaskets (8 for flat mounting and 8 for round surface mounting). 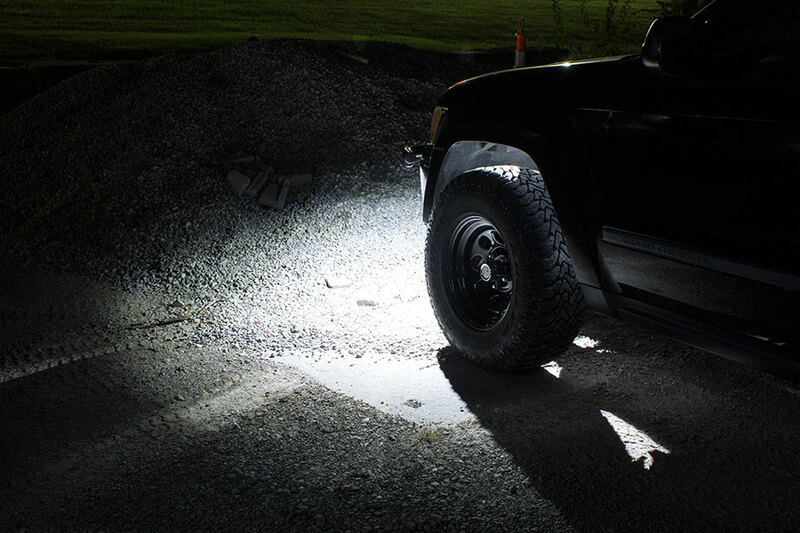 Each bright off-road rock light contains 3 LEDs that have an output of up to 213 lumens and emit a wide 150° beam angle. 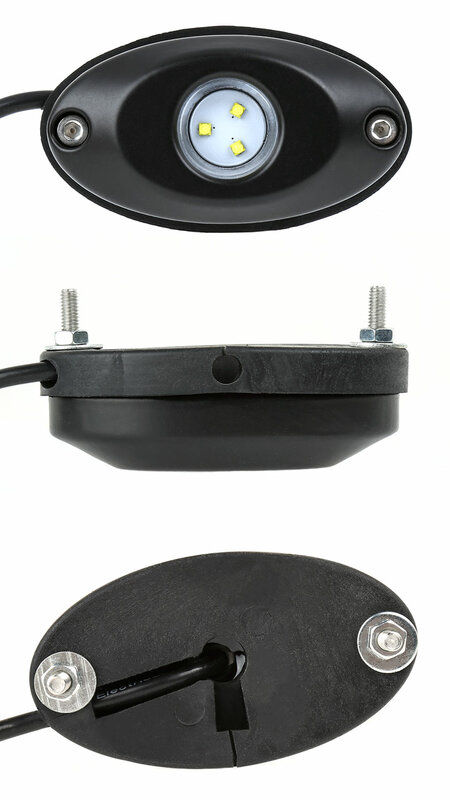 A waterproof aluminum housing and polycarbonate lens have an epoxy resin potting to protect internal components, and the rubber gaskets reduce shock and heat exposure while helping to guide wires. 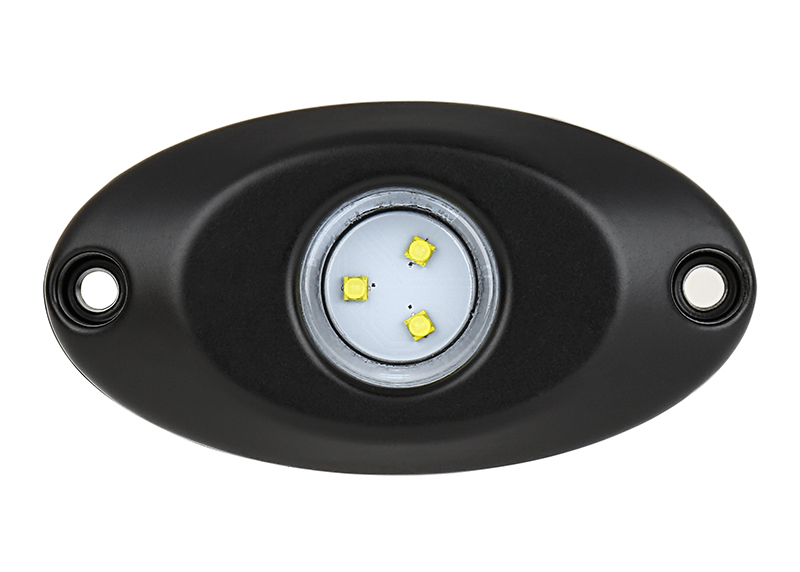 The energy-efficient LED lights are designed to last 50,000 hours and operate within a wide 9-32V DC range. 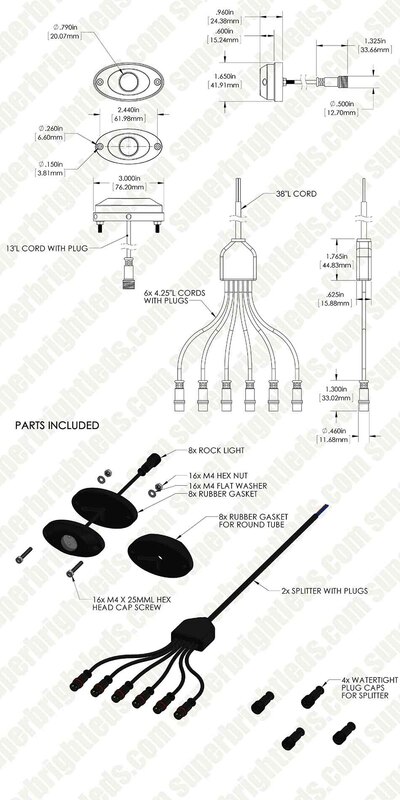 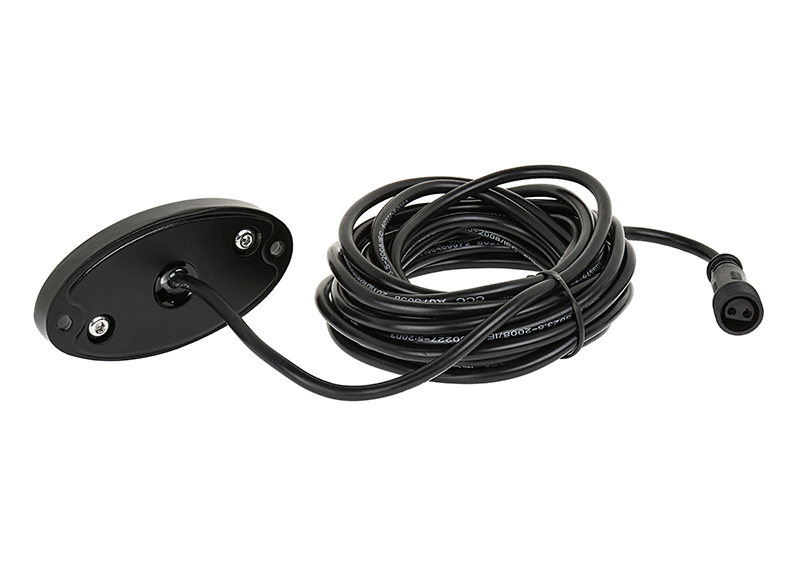 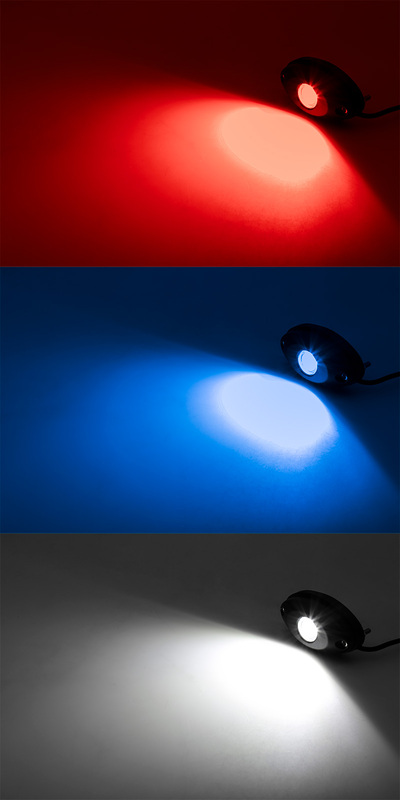 Red, white or blue LED rock lights install easily with 13' power wires and included hardware.